Your bathroom is not only one of the most-used rooms in your home, it likely takes the most abuse. Wet towels end up on the floor, drains get clogged with random items, and toilets back up because of carelessness. Older bathroom construction methods often left out key considerations, like proper ventilation. Additionally, materials used for bathrooms were more subject to wear and prone to failure. If you’re experiencing chronic problems with leaking pipes and drains, fixtures that don’t work, or an accumulation of mold and mildew, it may be time to remodel your bathroom. Many homeowners suddenly find that their bathroom no longer suits their lifestyle or growing family size. If you need to expand the size of your bathroom, you must also increase the rate of ventilation, and you may want to add an additional sink or add lighting. If the kids have all gone to college, you may want to add a Jacuzzi tub, or customize the space by beautifying it with custom tile. Indeed, the options are endless when you get started on your bathroom remodel, so it makes sense to hire a professional with extensive experience. Mike Winter, General Contractor will help you design the perfect bathroom for your lifestyle. From simple upgrades to a total bathroom remodel, we will get your job done quickly and affordably. It’s likely you have a general idea of how you would like your bathroom to look, but are unsure of how all of the various elements will come together to make the whole. The first kitchen remodel step you should take is to find an experienced contractor who will work directly with you to accomplish your design and budget goals. Are you looking to remodel your whole bathroom, or make specific upgrades? What materials and styles do you want to incorporate in the bathroom remodel? Would you like to add custom bathroom cabinets, fixtures, and showers? Will the plumbing and electrical features also need to be upgraded? Does your bathroom currently have mold and mildew issues? How do you use your bathroom, and how will it be used in the future? Once you create a general idea of what you want your space to look like, we can start working together to draw up the finer details of your Olympia bathroom remodel. You may prefer tile or stone to synthetic laminates, or you may want to consider how each feature lends itself to the overall design. We will help you choose materials and colors that bring your bathroom to life, and keep it looking great for many years to come. The design process is exciting and fun, and our goal is streamline this process by using our expertise to aid you in the decision-making process. Perfecting any bathroom takes time and careful consideration, but our professional experience will help simplify this process. We work with many clients who have specific tastes and a solid vision of how they want their bathroom to look, and it’s our job to turn that spark of an idea into a functioning reality. Custom Showers and Baths – These bathroom fixtures come in a vast array of styles and designs, so finding one that fits your lifestyle has never been easier. Whether you use your shower simply to clean yourself off after a day’s work, or you like the luxury of a large bath with power jets, we will construct a bathroom oasis that will be the envy of your houseguests. Vanities – This is another important bathroom feature that can offer unlimited design options. Your bathroom vanity can provide you plenty of light and space, outfitted with multiple sinks, and may be built with a number of different materials. Stone and Tile – You can use stone and tile in a variety of creative ways to make your bathroom a one-of-a-kind living space. Jacuzzi Tubs – There are few things as relaxing as a soak in a Jacuzzi, so if you’re remodeling your bathroom, you may want to explore this option. Heated Floors – When you step out of your shower onto a heated floor, you quickly understand why you decided to install radiant in-floor heating in your home and bathroom. Wainscoting – For many people doing an Olympia bathroom remodel, wainscoting is an exciting design option. At Mike Winter General Contractor, we will design and build your new bathroom while working with you to address every detail. This will be your bathroom – a place where you can get away from it all for a little peace and quiet. 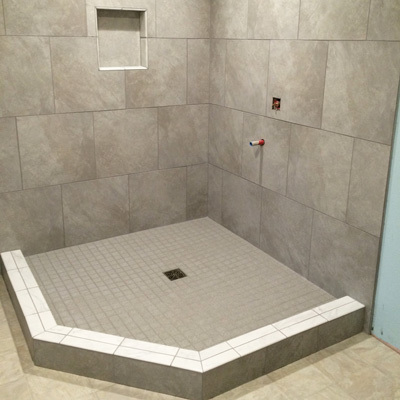 Call (360) 628-6716 today, so that we can get started on your bathroom remodel project.